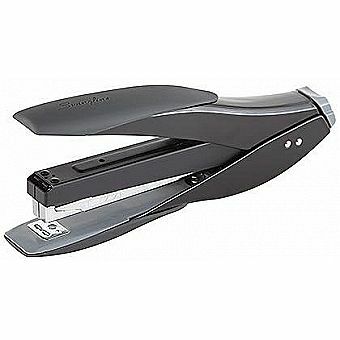 Ergonomic desktop manual stapler makes stapling up to 70% easier. Soft Grip materials offer comfort and long-lasting durability. Lightweight plastic construction ensures consistent use. Staples up to 20 sheets of 20 lb. paper and multiple paper types. Innovative Quickload™ system makes front reloading of 210-staple strips quick and easy. Uses standard staples. 100% performance guarantee. Limited lifetime warranty. By Acco Products.